Uncomplicated, uncompromised performance! 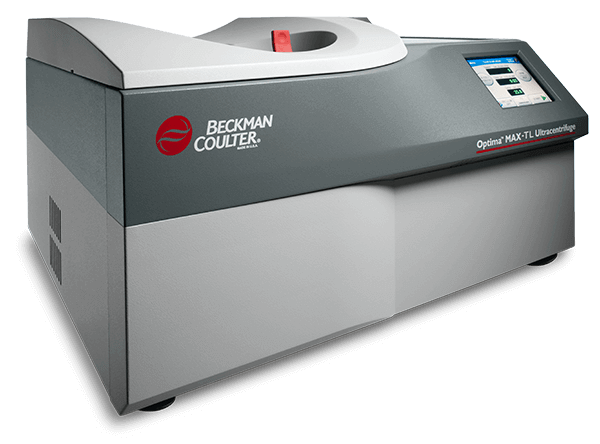 Reach the speeds you need for your separation demands with this compact, quiet and highly efficient tabletop ultracentrifuge. Packed with advanced technology yet simple to operate, the MAX-TL is designed as a total system, with the ultracentrifuges, rotors and labware manufactured and tested based on unique characteristics and interplay of dynamics to ensure optimal performance and safety. Spins at an incredible 120,000 RPM (with the TLN-120 Rotor), 657,000 x g. The Max TL is compatible with existing TL-Series rotors and labware. Includes multilingual software available in nine languages, the most available in the industry, for more efficiency and error-free operation across the globe. An ultracentrifuge is capable of separating high-molecular-weight compounds, viruses and subcellular particles for study.